﻿ How to burn DVD on Mac with DVD Creator for Mac? 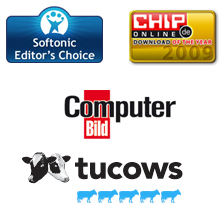 DVD Creator for Mac serves as the professional Mac DVD burning tool which allows you to burn videos to DVD on Mac and burn photo slideshows to DVD easily. This step by step guide will show you how to burn DVD using DVD Creator for Mac easily and effectively. Once you’ve downloaded DVD Creator for Mac, launch it. Now you may want to create a DVD project. 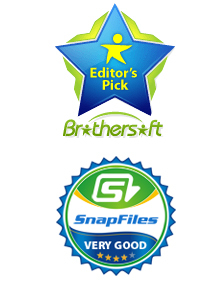 Click on "+" button to add your video files or photos to this program. Or, simply drag the specific videos or photos to the tool. You can merge, split or rearrange imported files by dragging freely according to your preference. If you wanna edit your project before burning them to DVD, you may edit them first. You can edit both videos and photo slideshows. Here we are going to look at how do edit them respectively. Highlight a file and click "Edit" to enter the edit interface. Crop: Simple scale the frame size to retain the part you want, or move the sliders to set the position and size. You can also adjust the zoom of the video like Keep Original, 16:9, 4:3. Effect: Append a special effect like Gray, Emboss, Negative, Black White and tweak the brightness, contrast, saturation to personalize your DVD videos. 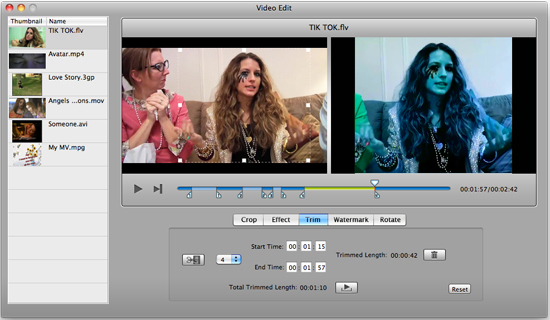 Trim: Easily trim your video to multiple segments by clicking "Trim" button and preview the selected clip. Watermark: Add either picture or text watermark and adjust the position as you like. Rotate: Four buttons: -90°, +90°, Horizontal Flip, Vertical Flip for you to easily rotate your video. 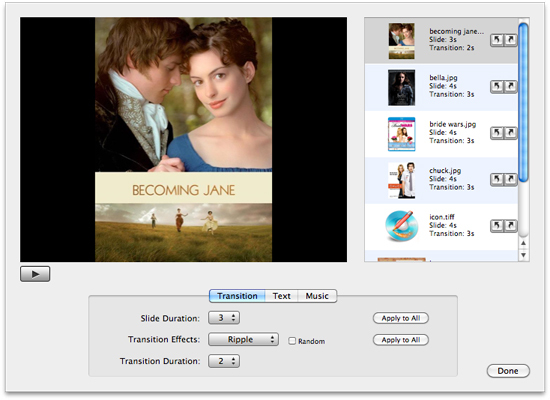 Transition: You can set Slide Duration, Transition Effects, Transition Duration and apply to all pictures in one click. Text: Add the text to your picture, select the font and adjust the size, color and position according to your preferences. Music: Simple drag the music in or out of the frame to add or delete the background music to your slideshow. DVD Creator for Mac lets you create DVD menu with rich selections of DVD menu templates which cover both animated and static DVD templates. Click the "Menu" button on the lower right bottom of the main interface to enter the menu editing window. By clicking the "Advanced Setting" button to customize the title miniature and the background music. You can customize frame, play button, video name, background picture and music. 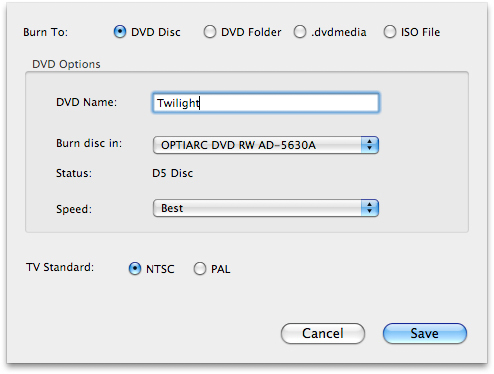 DVD Creator for Mac allows you to burn videos/slideshows to DVD disc, DVD Folder, ISO Image file and DVDMedia file. Choose the right output according to your specific need, insert a blank writable DVD disc and get started burning your videos or photo slideshows to DVD on Mac. Not ready to burn? DVD Creator for Mac lets you save the project file and you can reload the saved project file for further operation.